Our signature cuff bracelet that we introduced last year is almost sold out! This bracelet is coveted by mamas and mamas mamas all around. A simple copper cuff adorned with an engraving that says “MOM” and a heart to show her just how much you love her. Mother’s Day is right around the corner and once they are gone, they are GONE! We will not be releasing this style again. $7.99 in the shop with gift wrap options starting at just $2! We’ve teamed up with Our Kandles on this holiday collab! Our limited edition copper candles feature a boubon barrel scent – think oaky bourbon with a hint of vanilla and just a touch of coconut – in our roly poly vintage style copper whiskey cup. This delicious scent in our roly is available for a limited time only! Once they are gone, they are gone! Looking for Black Friday Deals before Black Friday? Check out our Table Ready Sale! 15% off all copper mugs and kitchenware items with code TABLEREADY17 … we also have express shipping options so you can set your Thanksgiving table! Check out our latest drop to hit the shop! Just in time for the holidays… Starting at only $12.99 there is something for every copper lover out there or on your list this year. The Copper Pineapple Bottle Opener is the perfect gift for pineapple lovers (and let’s face it, who doesn’t love the happy little fruit? ), add this easy to use bottle opener to your collection. Poppin’ bottles never looked so good. Coated in a thick layer of solid copper, this bottle opener is stainless steel underneath for strength. Shop this piece here. The newest edition to our copper bar tool line up, our copper cocktail strainer is the perfect pairing to our copper cocktail shakers + makes for only the best martinis, shaken not stirred. Shop this piece here. The perfect accent on any coffee table or bar, our hammered copper coasters are hand hammered and will help you say buh-bye to drink rings. Comes in pack of 4 copper coasters. Shop this set here. LIMITED EDITION! Diamonds are a girl’s (anyone’s?) best friend! This limited edition copper tumbler set features an all around diamond studded pattern. Includes 4 stackable tumblers. Perfect holiday gift + upgrade to a fancy mule drinker. Shop the set here. Want to always see what the lastest and greatest in our shop? Visit our NEW section! As our Summer Wedding Sale comes to a close today and being that we are amidst wedding season, we thought we would sit down with local photographer, Kimberly Conley to find out more about her wedding photography. Kimberly is a Ventura County native and a coveted photographer when it comes to engagement shoots or weddings. When we first came across Kimberly, we were absolutely enamored with her portfolio. The way she captures the most beautiful, yet simple moments and the way the light shines through her photos just as it shines through people’s hearts is undeniably breathtaking. She’s been a Copper Mug Co. supporter for some time through working together on local events such as the recent Local Love 805 Blogiversary to inviting us to be apart of styled wedding shoots. Recently, we teamed up with Kimberly on THREE, yes, THREE photoshoots for our new sister company, a wellness brand featuring copper water bottles called AYUR. More on that later. We asked Kimberly more about her love of the job. Check out the interview below! How long have you been a wedding/lifestyle photographer? I have been doing weddings and lifestyle photography for about 3 years now. Why do you love to shoot weddings? I love photographing weddings because there are so many special moments that just happen, everything is very candid and that’s what I love most about photography is documenting people’s special times in there lives. I’ve always loved pictures and having something to recall a moment or a day so I like being able to provide other families, couples and my own family with those special memories. What is the most exciting part of shooting a wedding? The best part of the wedding is when everyone isn’t nervous about the day anymore, when they are out on the dance floor. Everyone is very in the moment then. Favorite wedding location you’ve photographed: There are so many beautiful locations I’ve been to but I’d have to same McCormick ranch is one I have been to several times and the feel there is like your in your own backyard with your friends and family. Most beautiful moment you’ve captured: It would be hard to choose just one. I love just capturing people in there natural state, no posing. Copper Mug Co. specializes in wholesale copper mugs as well as custom copper mugs for special events and weddings. We have wholesale copper mug programs suited for boutiques and small retailers that want to become brand stockists as well as companies with larger needs for purchasing custom copper mugs in bulk. We offer different forms of customization on our custom copper mugs such as engraved copper mugs, etched copper mugs, embossed copper mugs, and printed copper mugs. 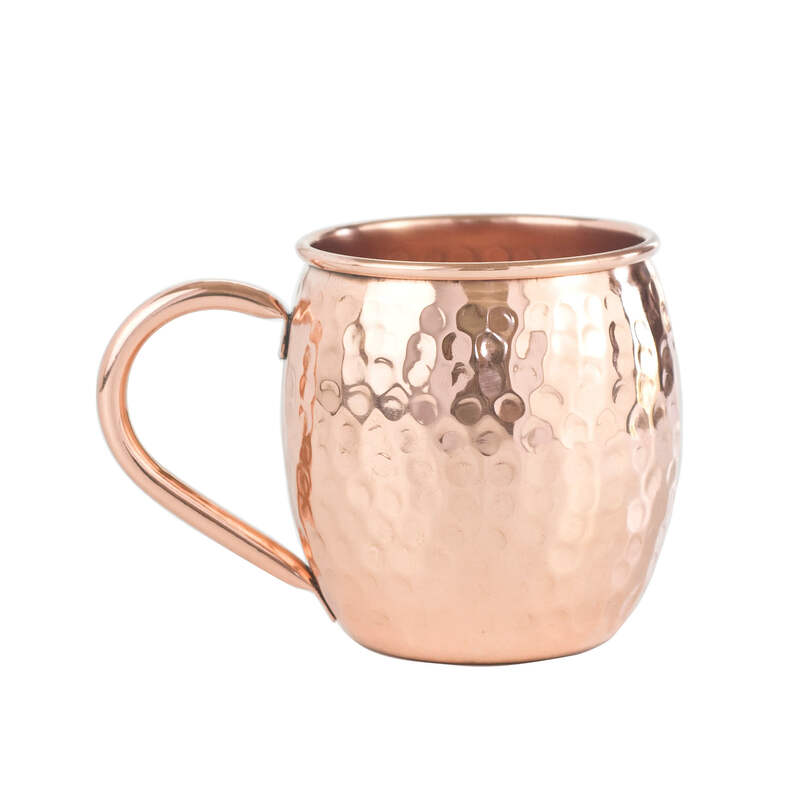 Our collections range with several styles to choose from that include classic copper mugs for moscow mules, unique copper mug styles, copper bar tools, copper kitchenware and even copper decor. It’s 2017! After all of the engagements over the holidays and New Years – we’re spreading the love with 10% off all wedding packages! Our custom copper mug wedding packages are designed with wholesale pricing for affordability. We offer engraving as well as help with logo design on all orders. We’re also celebrating that we received the 2017 Couple’s Choice Award from Wedding Wire.com – check out our profile here to read our reviews. 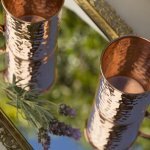 Copper Mugs remain one of the HOTTEST wedding trends of 2017. Your guests will love taking home a real solid copper mug while they remember your special day every time they imbibe! To complete the look, we also offer copper straws and hammered copper chargers. It’s the most wonderful time of the year… and it is the best smelling too from cookies to egg nog to fresh Christmas trees. This could possibly be our favorite DIY we have shared yet, and it’s a lot of fun to make with friends or even kids. (Nice to know we are bringing people together for more reasons than drinking!) Our new Copper Tumblers are available in a 4 pack and make the perfect vessel for this project. We’re going to show you how to obtain the smells of the season in candle form! These candles are the perfect homemade gift for neighbors, teachers, and anyone who likes to smell things that are delicious and stare at things that are pretty. Side note: this tutorial can work in any of our other copper pieces including the mini shots or mugs! First, you’ll want to create a prep area for pouring the candles – it can get a little waxy and messy if you aren’t so gentle. We used two cookie sheets lined with aluminum foil for easy clean up. Once you’re set up, you’ll want to measure out the wax for how many candles you will be making. Each tumbler holds 13 oz. so we are making 12 oz. candles. Next you’re ready to begin melting your wax. In a pot or sauce pan large enough to hold the pitcher, create a double boiler by putting a few inches of water in the pan on high heat. Place the pitcher into the boiling water and begin pouring in the wax chips to melt stirring frequently to melt faster. Continue heating the wax until it reaches 185 degrees. Once the wax has reached this temperature, take the pitcher off the double boiler and onto a heat safe surface. Measure out your fragrance; you’ll want to use 1 oz. of fragrance per 16 oz. of wax. Stir in the fragrance and store for a few minutes to combine. Melt wax to 185 and add fragrance; cool to 135 degrees. Let the scented wax cool for several minutes until it reaches 135 degrees – this is the temperature it is safe the pour the wax in the tumblers so it sets up perfectly. While you are waiting for the wax to cool, begin prepping the copper tumblers by wicking them. We used adhesive wick stickers which are extremely easy to use (also available from Candle Science here) and keep the wick in place. Try to get them as centered as possible at the bottom of the cup. You can also purchase wick bars which help keep the wicks centered once the wax is poured. We made our own out of recycled cardboard by cutting them close to the cup width and cutting a slit in the center to hold the wick. Once the wax has cooled and the copper tumblers are set up with wicks over the prep area, you’re ready to pour. Try to pour the wax quickly but steadily so it’s not spilled. Pouring quickly helps the wax set evenly without cracking. Let the candles set overnight and you’re finished! These candles make the perfect gift, and because they are so pretty, we decided to wrap them in clear cellphone with a simple ribbon. We hope you enjoyed this DIY and will now make your own Holiday Copper Candles in our Copper Tumbler Cups! As a thank you for reading our blog, we want to get you back with 10% off any order on our website. Please use code: CANDLEBLOG10 at checkout. Gift wrap your copper candle with simple clear wrap and bow. Succulents are everywhere these days, and that’s probably because they are easy to love. Especially in California during this drought, they thrive and without much water! One way to amp up your window sill or counter tops is with these beautiful copper mug succulents. They are incredibly simple to make with just a couple steps. We are in a hot and sunny climate with a little humidity from the ocean, so when looking for the right type of succulent to plant – consider your environment. Another thing to consider is that some plants work better in terrarium or dish gardens. The succulent that I selected for this DIY, Echeveria, is just perfect for growing and staying healthy in it’s copper mug. Bonus, it comes in a variety of colors so I decided to mix two colors and 3 different mug styles: The Roosevelt Hammered , The Original Hammered, and The Wine Cup. 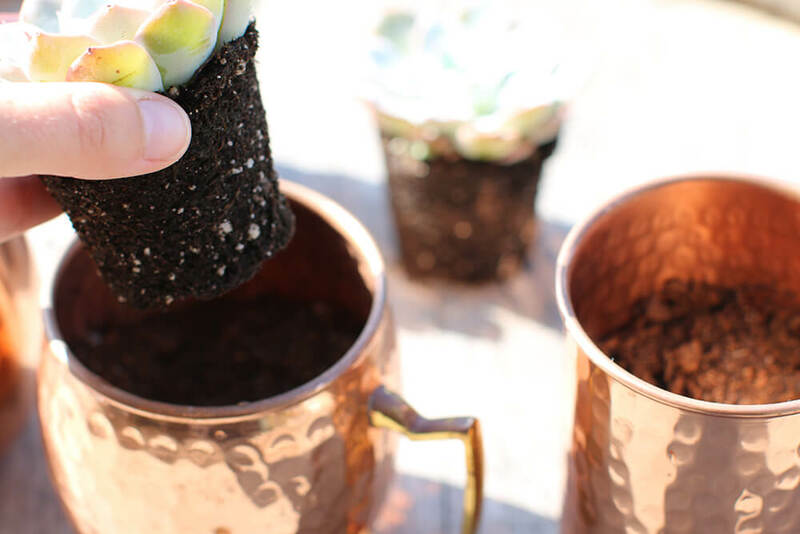 Pour soil into copper mugs, keep in mind the size of the succulent you are placing in the mug and fill about 3/4 of the mug with the soil. Spray the soil in the mug with water as well as soil around the roots of the succulent. With your fingers or a scoop, make a hole in the soil the size of the plant. Pull the succulent out of it’s container and place in the mug. Once the succulent is in the mug, add additional soil around the walls of the mug to fill the entire space around the plant. Give it a spray with the water and you’re done! Succulents are easy to care for, make sure that you check the needs for the specific succulent type that you select. This particular variety and most others require a lot of sunlight in a dry environment. They do great indoors on a table that gets a lot of sun or window sill. To water, spray the soil so that it’s damp and let it fully dry completely before you water again. Over-watering can kill them! 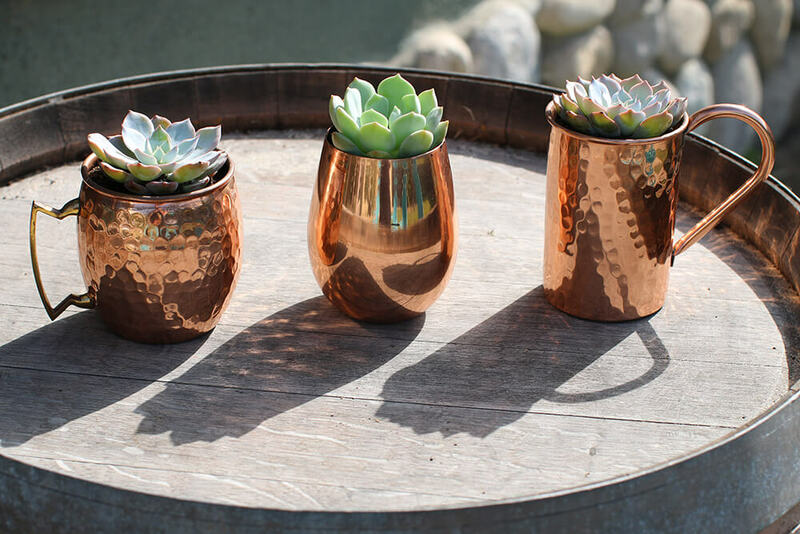 That’s it for this copper DIY and be sure to show us your copper mug succulents on Instagram or Facebook @coppermugco. BACK IN STOCK! THE BARREL & THE ORIGINAL HAMMERED! Back in stock alert! The Original Hammered and The Barrel Hammered (our two best selling styles of copper mugs) are back in stock and available from our shop as well as wholesale. For the month of April we are offering 10% off our already affordable wedding packages! Free logo engraving on all weddings! Don’t have a logo? We’ll help you design one! Check out our reviews on WeddingWire.com —-> Click here. Our copper straws make great gifts or favors for the entertainer! We offer 2 sizes of copper straws, small for rocks glasses and large for pint glasses which come in packs of 4. Here we dolled up the copper straws for gifting by wrapping them with a piece of twine and some lavender sprigs! Perfect for unique wedding gift favors, rustic wedding favors, rustic party favor gifts, mother’s day gifts, wedding gifts, thank you gifts. If you thought we’ve posted a lot about weddings lately here on our blog, Imbibe, we’re not done! We are ecstatic over the wedding buzz we have been getting lately and even more stoked to be working with such amazing couples this year! We are literally spreading the love, one copper mug at a time! Last month, Copper Mug Co. attended a very special event called The Jam, thanks to some vendor partners Otis & Peal vintage rentals and Oak, Barrel, & Bloom! Copper Mug Co. specializes in copper mugs for weddings and custom copper mug wedding favors. Our wedding copper mugs are great for tableware decor (it’s all about mixed metals) as well as gifts to your guest (that they actually want to keep forever!). To check out the post on Green Wedding Shoes, Click Here. We’ve been talking about weddings a lot here at Copper Mug Co. Why? 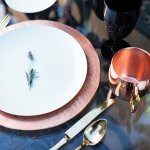 Well, according to TheKnot.com – Copper is IT this year in wedding world … step aside gold and silver (or maybe you’re into all of it because Mixed Metals is hot too). It’s also the perfect time for newly engaged couples to order their wedding copper mugs for their upcoming big day! Not only do we offer REAL solid copper mugs, we have wedding packages designed with affordability and ease in mind – no wedding mark up here. Our packages offer many styles to choose from (our entire collection) and also include custom engraving to add that personal touch to your day. Contact us at info@coppermugs.com for a wedding copper mug quote! We would also like to announce that we are offering a promotion in the month of January! Any wedding order placed in January will receive 10% OFF. Looking for some inspiration? Check out our recent styled wedding shoot… or look below at some of these major wedding events we have recently participated in! It is one of our biggest pleasures to work with brides on copper mugs for their wedding favors or tableware. Copper is one of the only metals that last a lifetime, literally. How symbolic is that for your wedding? Not only does it look beautiful and coordinates well with any color palette – copper mugs are a coveted gift and a major crowd pleaser among guests. We had the opportunity to work with some very talented vendors recently on a styled wedding shoot. While we work with clients all over the world, it was AWESOME to work with our favorite team of wedding professionals in our own backyard – Santa Barbara, California. Check out the gallery! We can’t wait to see what our brides come up with in 2016. We LOVE, love, here at Copper Mug Co. and one of our favorite things are weddings. We love working with couples to provide the perfect drinkware or favors for their big day. We were so delighted when Katie Hillenga from popular wedding site Coastside Couture contacted us to interview one of our co-owners, Alyssa for their Vendor Spotlight. This site has some serious wedding inspo with it’s gorgeous wedding galleries showcasing all styles and venue types to help you with plan your dream wedding. Alyssa and Katie talked about the founding of Copper Mug Co., Wedding Copper Mugs, and much much more. For wedding copper mugs, or copper mug wedding favors, contact us to get a quote! PS… we have some exciting wedding news coming in 2016! Stay up to date by visiting our Imbibe section of the website or following us on social media. Just in time for the holidays – you’ve been asking…so we’re deilvering! E-Gift Cards are now available in our shop! Not sure which copper mugs or copper baware to gift someone? Or maybe you’re just a last minute shopper? We’ve got you covered. Here at Copper Mug Co., we appreciate your feedback and are all about bringing new things to shop that our customers want so here are your gift cards, copper shoppers. Gift cards are available in various amounts – $25, $50, $100, $200. You can also purchase multiple gift cards for different recipients! Simply select the card amount, enter your recipients name and email address, enter in a gift message for the recipeint to see, then add to cart. Once you’ve completed your order, we’ll send your gift card to the recipient’s email to redeem! Gift cards are redeemable for up to one year after the initial purchase date! So you last minute Holiday Shoppers… yeah, you know you who you are – give the gift they really want this year! We’ve made a printable DRINK & BE MERRY gift tag template just for our customers. These tags are easily printable on any special paper you choose – we chose to use natural kraft card stock. Simply cut out the tag and whole punch the top and attach it to your bow or ribbon! PS… this gift tag only has our logo – not our company name so your recipient won’t be on to you! The “No Shaking” rule still applies. Click Here for the printable template! Happy Wrapping! We love WEEK99ER … Blogger, Becky Fixel is an interior designer, foodie, and majorly respected product reviewer based out of Detroit. Not only do we love her branding of her blog – the name comes from Becky reaching week 99 of unemployment – her blog content is constantly addicting with daily posts of everything from recipes and product reviews, to gardening tips and DIYs. We were so excited when she wanted to include The Wine Cup in her Countdown to Christmas Holiday Gift Guide!